PORT AU PRINCE - A United States-based global earthquake and structural engineering firm has found that there would be a significant risk of death and destruction if the Great North section of Haiti experienced an earthquake. The study by the Miyamoto International firm found that in the event of a major earthquake in the vulnerable Great North, probable damage in the four main cities would amount to at least 75,000 deaths, 350,000 people temporarily relocated and damage to more than 50 percent of buildings. The results of the study by the California-based company were revealed last week as the third meeting of the technical group on the Urban Risk Prevention Plan (PPRU) for Cap-Haitien was held in Haiti as part of the project “Support to Resilience to Natural Disasters” implemented by the United Nations Development Programme (UNDP) and funded by the Government of Japan. The experts pointed out that the region of the Great North is considered one of the country’s zones most exposed to seismic and tsunami risks. The high population, combined with weak urban planning regulations, make the large cities in the north of Haiti especially vulnerable to all natural hazards. Several stakeholders attended the meeting including the Secretary General of the North Delegation, the Ministry of Planning, the Haitian Red Cross, Oxfam-Haiti, the Centre for International Studies and Cooperation (CECI-Haiti) and the Office of the Secretary of State for the Integration of Persons with Disabilities. The organisers said the meeting provided an opportunity for the authorities to present the provisional zoning and the multi-hazard map of the Cap-Haitien commune. It also provided for the identification of issues and means, setting out the roles and responsibilities of each stakeholder and developing a targeted and effective local strategy. 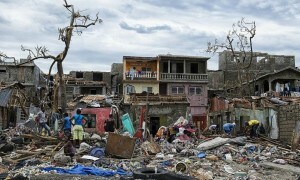 Haiti remains overshadowed by the catastrophic earthquake of 2010, which resulted in the deaths of more than 250,000 people. It had a magnitude of 7.0 on the Richter scale.